The Hocking Hills Region stretches across Hocking County and includes six major park localities-Ash Cave, Cedar Falls, Old Man's Cave, Rock House, Conkle's Hollow and Cantwell Cliffs. Attractions to the region include hiking, backpacking, canoeing, rock climbing, horseback riding and mountain biking. For every season, the Hocking Hills offers a grand display of beauty and is well known in the Autumn for a multitude of fall colors. Experience the wonders of the Hocking Hills at Eagle's Nest Cabin. Hocking Hills Cabins - Near Eagles Nest Cabins. Eagles Nest Cabin - Perfect for couples or families, this cabin offers a fully equipped kitchen, 2 bedrooms sleeping four (a futon is available to sleep two more guests) and a six-person hot tub. The spacious living room has a 27" television set with VCR/DVD players. Majestic Vacation Homes - Offers two different cabin rentals in the Hocking Hills region: The Majestic -Nestled into the woodland, this cozy two bedroom cabin has a hot tub, gas log fireplace and more. The American - Private and scenic, this comfy one bedroom cabin offers a hot tub, gas log fireplace and more. Hocking Hills Homestead - Hocking Hills Homestead has two types of lodging-one is a restored 1800's farm-like country home and the other is the woodland cottage pictured above called the Glenwood. These two beautiful getaways help you escape from the hustle and bustle of your busy world. Soak your stress and cares away in the hot tub. In the quiet of the evening you may wish to relax before the gas log fireplace or watch your favorite show or video tape on the TV/VCR. Only one mile from Old Man's Cave with a peaceful countryside. Beverly Hills Cabin - Beverly Hills Cabin, a private, romantic cabin in the Hocking Hills is only 5 minutes from the Hocking Hills parks. 10 acres of forest surround the cabin which features a full kitchen, outside picnic area and a five person hot tub. Wildlife wanders the property at will. This cabin is both kid friendly and pet friendly. Hummingbird Hill Cabins and Hummingbird Hills Ohio Cabins- Old Man's Cave chalets featuring cozy cabins for the romancing couple to larger cabins for families or gatherings. Cabins are built on the side of a ridge and have multiple levels with separate sleeping areas. On 140 acres. Pleasant Valley Cabins - Pleasant Valley Cabins overlook a large, wooded ravine, filled with birds, wildlife and foliage. Each cabin is over 1000 sq. ft & sleeps 4. Queen size beds, up & down, are adorned w/ pillow top mattresses & country quilts. The great room offers a stone fireplace with comfortable furnishings as well as DirecTV with DVD. The large deck offers picturesque views, a gas grill, table & chairs and a 5 person Hot Spring hot tub. Oakwood Cabins - New luxury real log cabins designed for couples. Oakwood Cabins is situated on a 70 acre farm with a stocked pond in the Hocking Hills. Only ten minutes from Ash Cave and Cedar Falls. Amenities include: hot tub on private screened porch, loft bedroom, gas log fireplace, fully equipped kitchen, TV/DVD/VCR, air conditioning and very private. Comfort in the Woods - Hocking Hills cabins with two spacious and secluded log cabins on 20 private acres. Both cabins have a hot tub, fully equipped kitchens and offer all the amenities of home. 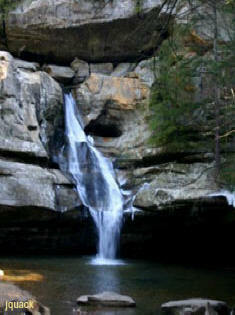 Within 5 miles of Old Man's Cave and Cedar Falls! These Hocking Hills cabins are all within the Hocking Hills Region and not far from Old Man's Cave. Copyright © Eagle's Nest Cabins 2005 - 2013. All rights reserved. Site Design and Concept-21 Crows Productions/Heart of Hocking.